Riparian trees as common denominators across the river flow spectrum: are ecophysiological methods useful tools in environmental flow assessments? Riparian tree species, growing under different conditions of water availability, can adapt their physiology to maximise their survival chances. Rivers in South Africa may flow perennially, seasonally or ephemerally (episodically). Different riparian species are adapted to survive under each of these different flow regimes by making use of surface, ground, soil, rainwater, or some combination of these. These water sources are available to varying degrees, depending on local climatic, hydrological, geohydrological and geomorphological conditions. This paper tests physiological differences among trees along rivers with varying flow regimes. In this study 3 parameters were selected and tested, namely wood density, specific leaf area and water use efficiency through stable carbon isotope measurements. All three parameters are quick, simple and cheap to determine and as such their value for standard-procedure river monitoring programmes or environmental flow requirement procedures was tested. Acacia erioloba is an arid-adapted riparian tree along the ephemeral Kuiseb (Namibia) and Kuruman (South Africa) Rivers that shows decreasing specific leaf area and increasing wood density correlating with deeper groundwater levels. Intraspecific changes for specific leaf area and carbon isotope values were demonstrated for Acacia mellifera and Croton gratissimus at varying distances from the active channel of the seasonal Mokolo River (South Africa). No significant differences in physiology were noted for Salix mucronata, Brabejum stellatifolium and Metrosideros angustifolia, growing along the perennial Molenaars and Sanddrifskloof Rivers (South Africa) under reduced flow conditions. Only the measurement of specific leaf area recurrently showed that significant physiological differences for trees occurred along rivers of the drier flow regime spectrum (seasonal and ephemeral). As such, this physiological measurement may be a valuable indicator for water stress, while the other measurements might provide more conclusive results if a larger sampling size were used. Specific leaf area, in conjunction with other carefully picked water stress measurement methods, could be considered for monitoring programmes during environmental flow assessments, river health monitoring exercises and restoration projects. This would be particularly valuable in rivers without permanent flow, where there is little species-specific knowledge and where current monitoring methods are unsuited. Aquatic and riparian community structure of rivers are primarily shaped by a river's flow regime (Jacobson, 1997; O'Keeffe, 2000) as the life histories of riparian plants are intimately tied to a river's natural flow regime (Meritt et al., 2009). Riparian species disperse, reproduce and survive in response to river flow timing, frequency, magnitude, duration and predictability (Mahoney and Rood 1998; Moser, 2006; Merritt et al., 2009). River flow also influences other environmental attributes important for riparian plant growth, such as groundwater recharge, nutrient deposition, sediment transport and substrate deposition (Merritt et al., 2009). These cause-and-effect relationships must be understood in order to successfully specify environmental water requirements (EWRs) that will sustain riparian communities (Merritt et al., 2009). The amount of water available as surface flow or groundwater must be understood in relation to how water is sourced to meet a plant's water needs and avoid drought-tolerance thresholds. This is especially important where water availability is reduced due to climate change, human abstraction or diversion of flow (Stromberg and Patten, 1990; Tabacchi et al., 2000; Hou et al., 2007; Merritt et al., 2009). Rivers are frequently classified according to flow regime (Uys and O'Keeffe, 1997), or based on a scale of flood days per annum (Poff and Ward, 1990; Jacobson, 1997). Classifications of river seasonality vary between countries, but an internationally accepted one is perennial (100% flow), semi-permanent (> 75% flow), intermittent streams (10-25% flow), and ephemeral (< 10% flow) (Hedman and Osterkamp, 1982; Jacobson, 1997; Boulton et al., 2000). Rivers in South Africa are located in a wide range of rainfall regimes; rainfall increases eastwards from the northwest to the mesic southeast of the country. Consequently, river flow across the country varies hugely. In addition, South African catchments convert a relatively small percentage of the mean annual precipitation to mean annual runoff: 8.6% when compared to (for instance) Canada at 67%. Further, South African rivers have one of the highest coefficients of variation about the mean annual runoff, which describes the overall flow variability in the world (Poff and Ward, 1989). So flow varies across the country, and for any one river flow in any one year varies considerably. Different riparian plant species grow under each of these ranges of flow conditions, accessing surface, ground, soil, rainwater, or some combination of these. Flow variations and, consequently, water availability, require plants to adapt their physiological structure in order to survive (Stromberg et al., 1992; Horton et al., 2001a, b; Rood et al., 2003). A plant responds physiologically to altered water availability, which may be induced by a combination of increased solar radiation, rising temperature and decreasing soil moisture. Physiological responses result in reduced stomatal conductance, transpiration, leaf internal CO2 concentration, carbon isotope discrimination (an index of water use efficiency and time integrated carbon assimilation) and xylem pressure potentials (Pockman and Sperry, 2000; Merritt et al., 2009). Other plant attributes express long-term responses to reduced water availability, including leaf abscission and leaf death (Merritt et al., 2009), increased leaf thickness and reduced leaf size (Rood et al., 2003), reduced shoot and stem growth (Stromberg and Patten, 1996; Scott et al., 1999; Rood et al., 2003), decreased vessel diameters (February and Manders, 1999; Schume et al., 2004) and increased wood density (Jacobsen et al., 2007). Severe water stress may lead to xylem cavitation, branch dieback and ultimately death (Tyree et al., 1994; Scott et al., 1999; Merritt et al., 2009). Currently the actual water sourcing needs, physiological adaptations and drought tolerance thresholds for riparian communities are poorly known, apart from a couple of woody genera and select species (Tabacchi et al., 2000). Previous research has focussed particularly on water relations of selected species to drought stress and altered flow regimes along impacted rivers in the United States (Stromberg and Patten, 1996, Rood et al. 2003, Stromberg et al., 2007). Thresholds for groundwater depletion were developed by measuring the onset and consequences of chronic water stress (Scott et al., 1999; Cooper et al., 2003; Merritt et al., 2009). Interspecific comparisons of plant attributes between indigenous and invasive species have helped our understanding of competitive advantages under altered water regimes (Nilsson and Berggren, 2000; Horton et al., 2001a, b; 2003). Methods applied in this kind of research include shoot growth, leaf area and trunk expansion, changes in leaf senescence, branch sacrifice, crown dieback, mortality, root growth changes, stomatal apertures and photosynthesis levels, xylem pressure potentials, xylem embolism and water use efficiency through 513C ratios (Pockman and Sperry, 2000; Rood et al., 2003). Stable oxygen and hydrogen isotope studies have been used to determine the water sourcing patterns and rooting depths of trees (Dawson and Ehleringer, 1991). This information has since been synthesised for Prosopis spp., Salix spp., Populus spp. and invasive Tamarix spp. to inform catchment management and successful riparian zone rehabilitation in the USA (Stromberg and Patten, 1996; Willms et al., 1998; Stromberg, 2001; Rood et al. 2003; Stromberg et al., 2007). In South Africa, river monitoring and data capturing is addressed through government efforts, such as the 'National Aquatic Ecosystem Health Monitoring Programme' (NAEHMP), of which the 'River Health Programme' (RHP) focuses particularly on the regular monitoring and data gathering for river systems (River Health Programme, 2006a). The RHP information is often used to aid the process of environmental flow assessments (EFAs). South Africa is well-known for its EFA methods, which include the Building Block Methodology (BBM, King et al., 2000), the Downstream Response to Imposed Flow Transformations (DRIFT, King et al., 2003) and the Flow-Stressor Response (FSR, O'Keeffe et al., 2002). Currently, an additional method is being developed in order to address the more intermittent and ephemeral systems, which have largely remained unaddressed to date (Rossouw, 2005, Seaman et al., 2009). Both the RHP and the EFA processes require an assessment of riparian vegetation EcoStatus prescribed in the 'Riparian Vegetation Response Assessment Index' (VEGRAI) (Kleynhans et al., 2007). VEGRAI catalogues contain plant location, cover, phenology, structure, localised impacts (trampling), abundance and plant/substrata relationship (King et al., 2000; Kemper, 2001; Kleynhans et al., 2007). Gathering other data for use in the EFA is described by King et al. (2000). However, species-specific knowledge of the water requirements of riparian vegetation is lacking and can contribute significantly to monitoring studies that need to document ecosystem response. Some ecophysiological work has already been completed in Southern Africa, some in the context of groundwater dependent ecosystems (Colvin et al., 2002, 2007), and others to do with surface flow and water availability (Swift et al., 2008; Crous, 2010). The relationships between riparian trees, groundwater depth and flood events has been investigated at some rivers in Namibia, Botswana and South Africa (Ward and Breen, 1983; Huntley, 1985; Rössing, 2003; Woodborne, 2004; Moser, 2006; Obakeng, 2007; Schachtschneider and February, 2010). Transpiration rates and riparian forest dynamics of seasonal tributaries of the Limpopo River in South Africa in relation to water availability and the occurrence of floods has been studied by Birkhead et al. (1997) and Botha (2001). There are ecophysiological studies on Colophospermum mopane, Acacia erioloba, Acacia xanthophloea, Acacia tortilis, Acacia robusta, Faidherbia albida, Tamarix usneoides and the invasive Prosopis glandulosa. (Botha, 2001; Obakeng, 2007; Schachtschneider, 2010; Schachtschneider and February, 2010) but none have been used to inform RHP or EFA studies. Ecophysiological methods likely differ in their applicability to integrate them into in RHP and EFA studies, as they differ with respect to their ease of execution and cost and they do not all quantify plant response over similar periods (hours to years). Finally, they also differ in their value as once-off measurements. Any methods considered for integration into EFA and RHP studies should ideally be easily executed, affordable and should provide results with once-off measurements, as repeat measurements can be prohibitively expensive. In this paper 3 ecophysiological methods were selected that were potentially suitable for integration into monitoring studies for EFAs and restoration projects according to the abovementioned criteria. A preliminary investigation was conducted at study sites, chosen across the water availability spectrum. This includes ephemeral rivers with groundwater as the primary water source, seasonal rivers with intermittent stream flow and perennial rivers with permanent flow. Sites were selected at rivers in 3 flow regimes: ephemeral, seasonal and perennial, so as to address rivers across the water availability spectrum. For the ephemeral site, groundwater depth was the key variable assessed due to the rarity of flood events. For the seasonal river, the flow versus no-flow scenario was assessed and for the perennial river the full flow versus reduced flow was looked at. The erratic flow conditions of non-perennial rivers do not allow the same diversity of aquatic and semi-aquatic fauna and flora to establish, when compared to perennial rivers (Davies et al., 1993; Kemper and Boucher, 2000; Darwall et al., 2009). Terrestrial trees and shrubs are the most obvious and permanently established biota associated with non-perennial rivers (Jacobson et al., 1995; Kingsford, 2000). The unpredictable hydrology, strong groundwater association, remote location and largely terrestrial biota of non-perennial rivers make current EFA methods used for wetter systems unsuitable. One of the challenges is to give added focus to groundwater and riparian vegetation, as these are the most prevalent yet least understood aspects of non-perennial rivers (King et al., 2000). The ephemeral rivers lie along the middle-to-lower reaches of the Kuiseb River in the Namib Desert and the middle reaches of the Kuruman River in the Kalahari. In 2007 samples of adult specimen (> 3 m) of the indigenous tree Acacia erioloba (Camelthorn) were collected at Gobabeb (23°33'726 S, 15°02'112 E) and Swartbank (23°18'212 S, 14°45'672 E) in the Namib Naukluft Park in Namibia, as well as on the farm Gannavlakte (26°57'578 S, 21°50'234 E) just south of the Botswana border in South Africa. The first two sites were located in the hyperarid parts (0-12 mm/a) of the Namib (Henschel and Seely, 2008), along the lower reaches of the Kuiseb River, with a comparable geomorphology of deep alluvial sands, consisting of a mix of river and aeolian dune sands (Ward and Von Brunn, 1985). Between 1962 and 2006 flood duration was an average of 8.1 days at Gobabeb and 2.2 days south of Swartbank. Flood duration and the number of floods per annum decline along the river gradient to an average of 7.9 events in the upper catchment (just outside Windhoek) and to only 0.9 floods south of Swartbank (Jacobson, 1997; Moser, 2006). The Gannavlakte site is situated along the middle reaches of the Kuruman River, in an area underlain by deep aeolian Kalahari sands. There are no gauges along the middle reaches of the Kuruman River and anecdotal evidence suggests that the Kuruman River has flowed in all or parts of its middle and lower reaches about 10 times in the last 116 years (Meyer et al., 1985; Ross-Gillespie, 2004). These rare flood events result in groundwater recharge along the active river channel (Dahan et al., 2008) and Gobabeb has an average depth to the groundwater table of 4 m, Swartbank 21 m and Gannavlakte 56 m. The groundwater is the permanent water source for riparian trees in this area (Schachtschneider and February, 2010) and tree physiology was investigated against depth to the groundwater table. The Mokolo River is one of the larger rivers in the Limpopo Province, with its catchment receiving up to 660 mm/a and flow amounting to an average annual 315 Mm3/a (Department of Water Affairs, 2008). The river is perennial in its upper reaches, but the lower reaches are semi-permanent to intermittent. Irrigation currently poses the highest water demand on the river system, but the construction of the Medupi power plant and associated mines is predicted to reduce flow further in the lower river reaches (River Health Programme, 2006b; Schachtschneider et al., 2011). Two sites were chosen along the lower river reaches (23°46'16.32" S, 27°45'18.9" E; 23°32' 21.84" S, 27°42'50.3994" E) and samples were collected from upper riparian trees during high flow in April 2010. Acacia mellifera and Croton gratissimus are not typical riparian zone species, but were found to be transitional species in both riparian zones and the rest of the catchment. Ten samples of adult specimens of each species were collected in 2011 immediately adjacent to the active river channel, as well as upland of the riparian zone (>100 metres upland). Paired sites were selected at 2 perennial tributaries of the Breede River in the Western Cape, the upper foothills of the Sanddrifskloof (33°29' 9" S, 19°31'45" E) and the Molenaars (33°43' 11" S, 19°11'17" E) Rivers, respectively; paired sites were upstream and downstream of abstraction points along foothill-pool reaches that remove up to 50% of the summer base flows (Table 1). The paired sites were geomorphologically comparable. Ten adult trees (2-3 m in height) of each species were sampled in the low-flow season (April) of 2012 at each of the 4 sites: Salix mucronata, Metrosideros angustifolia and Brabejum stellatifolium. 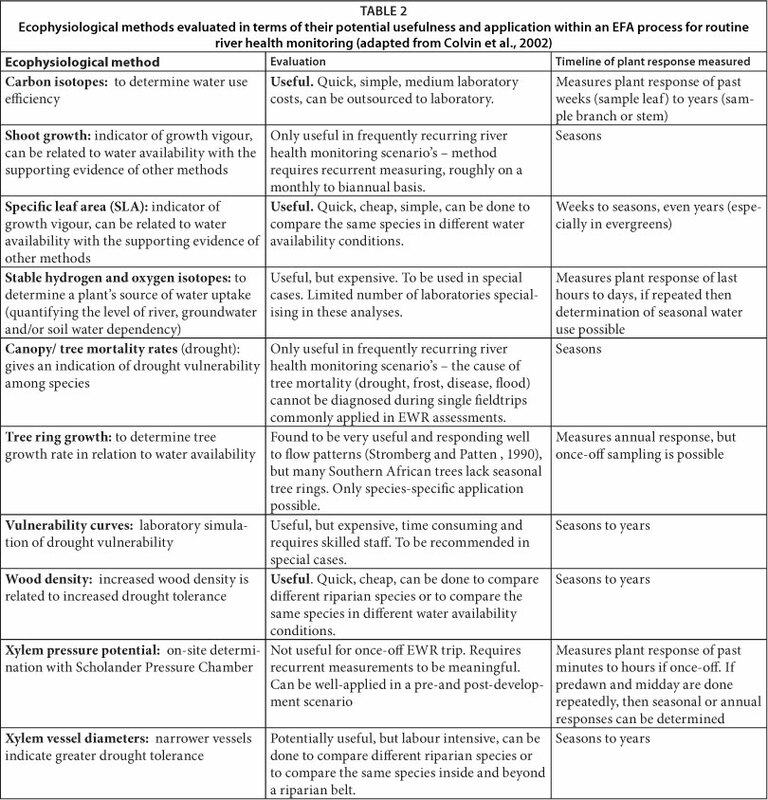 Several ecophysiological methods to quantify water availability were evaluated in terms of simplicity, ease of collection, cost-effectiveness, period over which the plant response may be quantified (hours to years) and their value as once-off measurements (Table 2). The table of possible methods was selected, based on previous work done by Colvin et al. (2002). The best three measurements were specific leaf area, wood density and measures of stable δ13C isotopes. Wood density is an indicator of xylem traits that relate to water stress tolerance. Narrow xylem vessels and thick xylem fibre walls are a structural indicator of drought tolerance (Jacobsen et al., 2007). Wood density has been used to predict the impact of climate change on plants and to compare water stress tolerance among desert plants (Hacke et al., 2000; Jacobsen et al., 2007). One twig per specimen was cut in the field (10 cm long and 0.7 cm in diameter) and transported back to the laboratory in a cooler. There, they were saturated in degassed water for 24 h, in order to obtain maximum weight (Jacobsen et al., 2007). Twigs were cut to a length of 2.5 cm and the pith and bark were removed with a razor blade. Wood volume was determined by displacement in a graduated cylinder (Jacobsen et al., 2007). The wood was then oven dried for 24 h at 75°C and the dry mass was determined. Wood density was expressed as g/cm3. Leaf δ13C values are determined by the difference between CO2 concentration inside the leaf versus ambient air. As plants become more water stressed and stomata close, the leaf/ambient air ratio increases and results in less negative 513C values (Ehleringer, 1993). Hence stable carbon isotope ratios are used to establish the amount of water stress a plant is under. Twenty fully expanded, mature leaves were collected for stable carbon isotope analysis from each study tree at all sites. Leaves were treated with HCl overnight and subsequently washed, oven dried at 70°C and pulverised manually, using a mortar and pestle. Ground samples were weighed and labelled in duplicate and a standard (Merck Gel) was included with every 12 samples. The samples were analysed using a Thermo Flash Elemental Analyser (1112 series) integrated via a Thermo Finnigan Conflo IV system with a Thermo Delta V Plus Isotope Ratio Mass Spectrometer. The precision was 0.1%o for all samples. All statistical analyses for SLA, wood density and 513C isotopes measurements were conducted using Statistica 8.0. Statistical significance for the ephemeral study component, having 3 sample groups (Gobabeb, Swartbank and Gannevlakte) was assessed using one-way ANOVA tests. The data were log transformed when assumptions of heterogeneity of variance and normality were not met. The seasonal and perennial study components had 2 sample groups each. Hence we used independent Student T-tests to detect any significant differences (p < 0.05). Assumptions of normality and heterogeneity of variance were tested. Acacia erioloba at Gobabeb had the largest SLA, showing greatest water access, while specimens at Swartbank and Gannavlakte were similar (Table 3). The wood density results show A. erioloba at Swartbank were most dense, while at Gobabeb and Gannavlakte the values were the same. 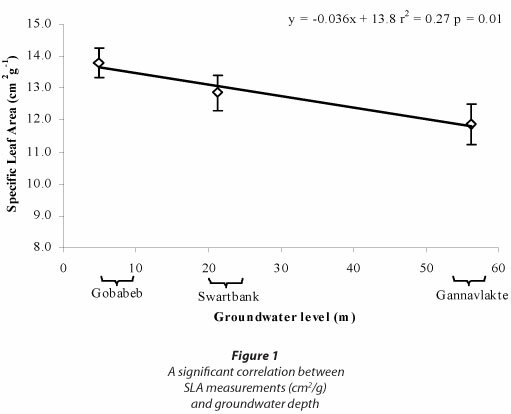 The Gobabeb δ13C values were most enriched, indicating least WUE, while Swartbank and Gannavlakte results were more depleted and similar, indicating greater WUE (Table 3). Despite promising trends observed in SLA and δ13C, none of these were significant (one-way ANOVA; Table 3); however SLA was significantly correlated with groundwater levels (Fig. 1). Riparian A. mellifera trees at the Mokolo River had significantly larger SLAs when compared to upland specimens (p < 0.001), as well as significantly enriched δ13C isotope values (p = 0.04). 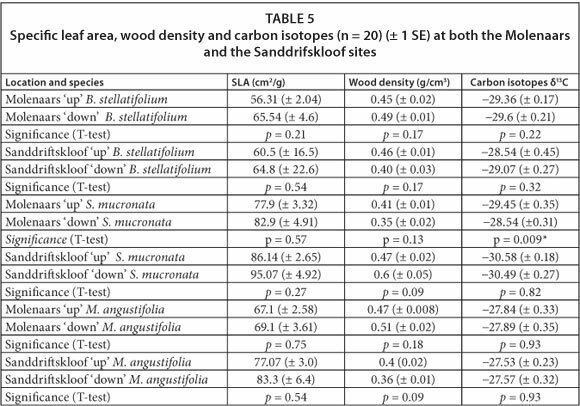 Wood density was greater for the upland specimens, but not significantly so (Table 4). Riparian C. gratissimus SLAs were significantly larger than upland specimens (p < 0.0001), and also were significantly enriched in δ13C isotope values (p = 0.04). There were no differences in wood density. A total of 6 T-test comparisons were run per method for the perennial sites at the Molenaars and the Sanddrifskloof Rivers (Table 5). All SLAs were larger downstream when compared to upstream, although none of these differences were statistically significant. There were no differences in wood density for any of the comparisons, and no clear pattern could be distinguished between up- and downstream sites. Stable carbon isotope results did not reveal a clear pattern as each species responded differently: values of stable 13C isotopes for B. stellatifolium were higher upstream versus downstream, indicating greater WUE; values for M. angustifolia were the same up-and downstream; values for S. mucronata were higher downstream at the Molenaars River (p = 0.009). Three ecophysiological methods were used to measure the responses of various riparian trees to changes in water availability under 3 different flow regimes. The three measures differed in their ability to produce valid differences for plants under each flow regime. There were no significant differences for any of the measurements between A. erioloba specimens growing in different groundwater-level scenarios in an ephemeral setting, but a significant correlation was found between SLA and groundwater levels. Data collection at the ephemeral sites was originally broader than what is covered in this paper. In addition to finding significant correlation between groundwater levels and SLA, there were also significant correlations found between groundwater level and shoot length, predawn and midday xylem pressure potentials, radial stem growth and xylem vessel diameter (Schachtschneider, 2010), providing evidence from multiple methods that groundwater depth does in fact have an effect on the physiology of A. erioloba. It has thus been shown that deep water sourcing does affect the species' health and functioning, similar to observations made for Prosopis velutina in the Sonoran Desert in the USA (Stromberg et al., 1992). No significant relation could be established between groundwater and stable carbon isotopes and wood density. It is possible that A. erioloba did adapt various parts of its physiology to deal with differences in groundwater levels, but these were not detected. This illustrates the value of using multiple techniques to bolster conclusions. Plants may adapt very differently to water scarcity and several methods may be necessary to reach a valid conclusion. Despite the fact that both the Kuiseb and the Kuruman Rivers traverse deep sand in arid environments, the geographical distance between the Namib and Kalahari sites may have led to other sources of variation that could have influenced the outcome. Both SLA and stable carbon isotopes showed significant differences between all riparian and non-riparian specimens along the Mokolo River, but wood density did not provide significant results. The success of SLA and stable carbon isotope measurements in this riparian versus non-riparian setup may lie in the fact that the methods were used to measure specimens growing in two very different ecological and geomorphological zones that have distinctly different water access. Similar comparisons were successfully done in previous work (Schachtschneider and February, 2013), where A. erioloba and P. glandulosa showed markedly different physiological adaptation based on their location in either riparian or non-riparian zones. Only one significant δ13C result was found at the perennial Molenaars River for S. mucronata. The selected tools were not able to detect a physiological response to reduction in flow. Trees might access alternate sources of water, such as soil or groundwater (Dawson and Ehleringer, 1991) - this would explain the indifference between the trees situated upstream-and downstream of the abstraction point. It would therefore be useful to investigate alternate sources of water with the help of stable hydrogen and oxygen isotopes. Alternatively, other methods might have been successful, as proved by tree ring growth measurements that were successfully correlated to stream flow in the USA (Stromberg and Patten, 1990). The results of this preliminary investigation are insufficiently clear to integrate into standard-procedure monitoring programmes or EFR processes. Wood density results showed no significant differences under any of the three flow regimes. Wood density measurements are a fast and rough indicator of xylem structure, as it is influenced by vessel area as well as percentage fibre wall (Jacobsen et al., 2007). In its stead, it may be beneficial to consider vessel diameter measurements, which are far more demanding, in terms of skill, labour and time, than wood density, but also provide more insight into xylem anatomy. Given the mixed results for SLA and 513C, it may not be feasible to only look at measurements that are cheap, simple and fast to conduct. Rather, it appears that ecophysiological investigations over and above other monitoring should be tailored to the specific situation at hand. For example, stable oxygen and hydrogen isotopes are valuable to understand the dependence of key species on various water sources, making it possible to prioritise the protection or abstraction of a particular source, such as groundwater versus floodwater. Inclusion of methods such as these in pre-and post-development scenarios, as well as RHP assessments, should be considered on a case-by-case basis. Species-specific information is currently not the focus of routine monitoring programmes such as the RHP. The current focus is the determination of the overall ecological status of a river and an overall look at biological communities, including the riparian vegetation zone as a whole (River Health Programme, 2006a). The many benefits to this approach are clear, and the VEGRAI process is widely used for both RHP and EFR processes, providing a good overview of current status and habitat integrity. However, the VEGRAI method is limited in that it is highly objective and observer-dependent, making it difficult to compare over time and between different observers, who differ in their rating process, species knowledge, experience, time in the field and quality of work. The whole spectrum of ecophysiological methods provides more accuracy and repeatability, in that the methods are standardised and repeat-able. Furthermore, the application of ecophysiological methods provides an opportunity to understand key riparian species better, allowing for more accurate predictions of change in vegetation in relation to reduced water availability. The ecophysiological methods of this paper showed better trends in the more arid river systems, where terrestrial riparian vegetation plays a more crucial role in the absence of aquatic communities. Distinct species, such as A. erioloba, for example, are often considered key tree species within these ecosystems (Milton and Dean, 1995). Species-specific understanding of such key species would greatly enhance an understanding of habitat integrity and risk of change in such river systems. It would also help to address the almost complete lack of data that currently exists in these systems and help to inform EFR determinations in low-flow river systems, which presently lack suitable methods. The authors of this paper argue that any monitoring and EFR determinations in low-flow river systems should include a well-considered collection of ecophysiological methods in order to ensure that the health of the riparian zone is well-understood at a community level, as well as at the level of an individual, or keystone species. The authors would like to thank the various funders: the CSIR Parliamentary Grant, the WRC (Water Research Commission) for work done in the Western Cape, the Water Research Fund for Southern Africa (WARFSA) for part of the presented research done in the Kuiseb River and the NRF for part of the work presented from the Kuruman River. HACKE UG, SPERRY JS and PITTERMANN J (2000) Drought experience and cavitation resistance in six shrubs from the Great Basin, Utah. Basic Appl. Ecol. 1 31-41.